For other uses, see Geode (disambiguation). Geodes (derived from the Greek word "γεώδης" meaning "Earth like") are geological secondary formation within sedimentary and volcanic rocks. 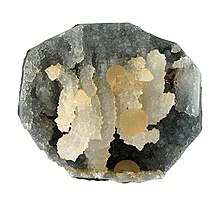 Geodes are hollow, vaguely circular rocks, in which masses of mineral matter (which may include crystals) are secluded. The crystals are formed by the filling of vesicles in volcanic and sub-volcanic rocks by minerals deposited from hydrothermal fluids; or by the dissolution of syn-genetic concretions and partial filling by the same, or other minerals precipitated from water, groundwater or hydrothermal fluids. Geodes can form in any cavity, but the term is usually reserved for more or less rounded formations in igneous and sedimentary rocks. They can form in gas bubbles in igneous rocks, such as vesicles in basaltic lava; or, as in the American Midwest, in rounded cavities in sedimentary formations. After rock around the cavity hardens, dissolved silicates and/or carbonates are deposited on the inside surface. Over time, this slow feed of mineral constituents from groundwater or hydrothermal solutions allows crystals to form inside the hollow chamber. 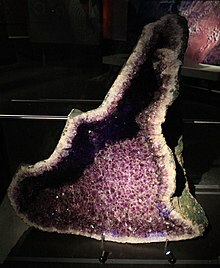 Bedrock containing geodes eventually weathers and decomposes, leaving them present at the surface if they are composed of resistant material such as quartz. When cut in half, visible bands corresponding to varied stages of precipitation may at times show patterns that reveal points of fluid entry into the cavity and/or varied colors corresponding to changes in chemistry. Geode banding and coloration is the result of variable impurities. Iron oxides will impart rust hues to siliceous solutions, such as the commonly observed iron-stained quartz. Most geodes contain clear quartz crystals, while others have purple amethyst crystals. Still others can have agate, chalcedony, or jasper banding or crystals such as calcite, dolomite, celestite, etc. There is no easy way of telling what the inside of a geode holds until it is cut open or broken apart. However, geodes from a particular area are usually similar in appearance. Geodes are common in some formations in the United States (mainly in Indiana, Iowa, Missouri, western Illinois, Kentucky, and Utah). They also are common in Brazil, Namibia, and Mexico. Geodes are also abundant in the Mendip Hills in Somerset, England, where they are known locally as "Potato Stones." In 2000 a team of geologists found a cave filled with giant gypsum crystals in an abandoned silver mine near Almería, Spain. The cavity, which measures 1.8 × 1.7 meters and is 8 meters in length, would be the largest crystal cave ever found. The entrance of the cave has been blocked by five tons of rocks, and is under police protection (to prevent looters from entering). According to geological models, the cave was formed during the Messinian salinity crisis 6 million years ago, when the Mediterranean sea evaporated and left thick layers of salt sediment). The cave is currently not accessible to tourists. The world's largest known crystal cave or vug is Crystal Cave, a celestine geode 35 feet (10.7 m) in diameter at its widest point, located near the village of Put-in-Bay, Ohio, on South Bass Island in Lake Erie. ^ a b "Geodes: The rocks with a crystal surprise inside!". geology.com. Retrieved 2017-12-30. ^ "The Quarries". Dulcote, Somerset. Retrieved 2017-12-30. ^ Amos, Jonathan (12 June 2000). "Giant Crystal Cave Discovered". BBC. Retrieved 3 September 2011. 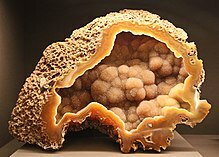 Wikimedia Commons has media related to Geodes. Illinois State Geological Survey. "Geodes—Small Treasure Vaults in Illinois" (PDF). Archived from the original (PDF) on 2007-09-27. This page was last edited on 20 March 2019, at 01:12 (UTC).